This is Book 5.5 in Lindsay Buroker’s Emperor’s Edge series, so if you haven’t read the first five books, this review won’t make a whole lot of sense. As well, beware…here there be spoilers! (YOU’VE BEEN WARNED). This short novel picks up fairly soon after the explosive ending of Blood and Betrayal. Our tired, worn, and grim adventurers are headed back towards Stumps on a steamboat–hiding in various places about the ship. It becomes obvious early on that this steamship is not only hosting a few remaining Forge members, but another secret as well. Enforcers crawl about the boat and several members of Amaranthe’s group become suspicious that something sinister hides somewhere in the ship. Without telling too much about the plot, I will tell you that there are some pretty exciting character developments in this installment (especially if you love developments of the romantic variety). This may or may not involve our favorite assassin (;-)). As you know, I’m disdain giving away all the best bits of a book in a review, but I’m a big fan of teasers, so as Ms. Buroker herself put it on Twitter a while back, “Watch out for those sooty smokestacks” ;-). I think everyone who enjoys Buroker’s other novels would be putting themselves at a disadvantage if they didn’t also read her novellas and short novels that fall between books. All of them add depth and excitement to the already-FANTASTIC series. This book, for me, felt much more necessary than even the other ‘tween tales. There was excitement, plot development integral to the greater story, romance, and of course, EXPLOSIONS! 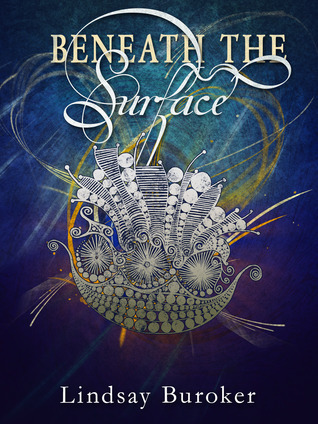 If you’re dying for more of your favorite outlaws, you simply have to check out Beneath the Surface while you’re waiting on EE6! Go and check ‘em out!